Tattoo Deal for Thursday 21st! Extremely late notice, but I had a rescheduling of tomorrow’s appointment which means tomorrow 21st March is free all day! 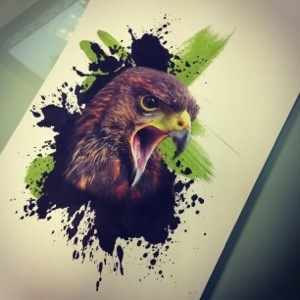 I’ve done the following badass design that I’d love to do after my latest similar owl tattoo i did got such good reviews! 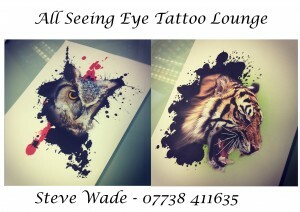 Tattoo Deal for Friday 15th only! SORRY – THIS IS NOW TAKEN! 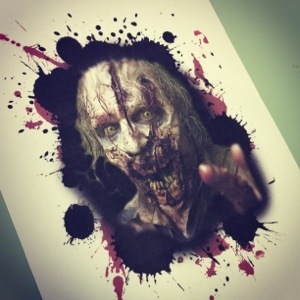 Right, tomorrows free, so I thought i’d do a tattoo dealio, just to fill the day up. I did these designs recently that i’ve really been wanting to tattoo, so the first person to get in touch can have one of these two designs for £80. Tomorrow only. Pretty big too. Preferably leg! Stay Connected to our day to day going ons! We are fully connected, we are social butterflies! If you want to see our work, we’re proud of it and so it can easily be found online!! So here is where you can find our work. 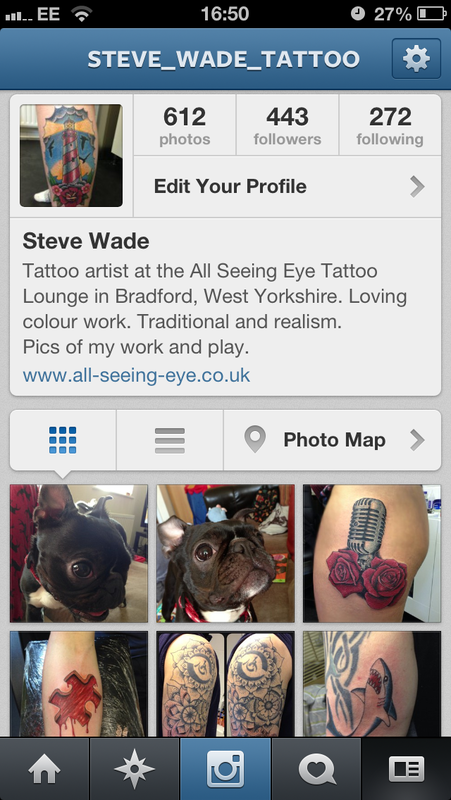 Instagram: @steve_wade_tattoo – This is a lot of the tattoos i’ve done day to day along with some of my personnel photos, mainly of my dog and my kids. But mainly tattoos and sketches. Facebook: http://www.facebook.com/AllSeeingEyeTattoo This is my business ‘Like’ page, so find it and hit the ‘Like’ to see our latest work, designs and any offers we’re doing. We also have a Facebook profile too. ‘All-Seeing Eye-TattooLounge’ find me and add me as a friend, I use this profile on a daily basis to stay connected to my customers easily. 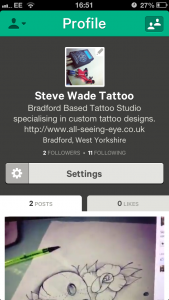 Vine: Steve Wade Tattoo – All Brand new ‘Vine’ !. This has only just come live for us in the last hour or so, but it looks like fun. Think of it like Twitter or Instagram but with short 6 sec videos. Worth checking out. 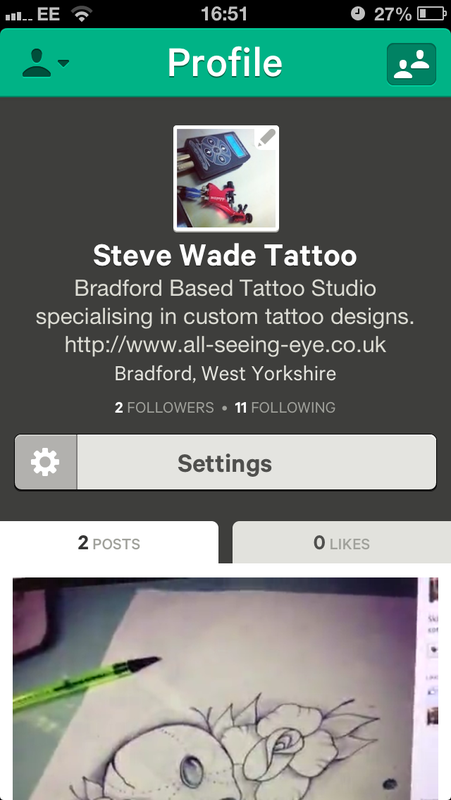 Twitter: @BradfordTattoos – Everyone knows what Twitter is. We only really post on this from other social medias otherwise that’d be our day gone!! Follow @BradfordTattoos if this is your preferred choice! Then theres always our website: www.all-seeing-eye.co.uk (incase you’re reading this blog on something other than the website!!). If you’re liking our work, thank-you and tell your friends!!! We rely heavily on word of mouth. 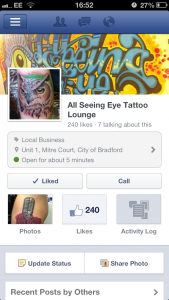 this is because we’re not a high street tattoo studio, we’re Bradfords secret tattoo studio! You have to find us, but we’ll make it worth your while when you do.